Peach State Roofing’s office recently completed a re-roofing project, located just off I-24 in Nashville, TN. This project came to fruition after working with the building’s owner for over a year, servicing their leaks and trying to prolong the inevitable and costly roof replacement. The re-roof project consisted of 2 buildings, containing various tenants. The total square footage, combined was just over 400,000. Each of these buildings would be receiving a new Johns Manville retro-fit roof system over the existing metal R-panels. The Peach State Roofing crew began the project by making it a safe place to work, for both the crews and the tenants. After speaking with each tenant regarding the project, the crew installed safety flagging on the roof and roped off areas that could be hazardous to the public. Once the safety was in place, the roofing materials were hoisted to the roof and staged. Due to the size of the project, the load consisted of multiple staging areas, which all had to be coordinated with onsite personnel. 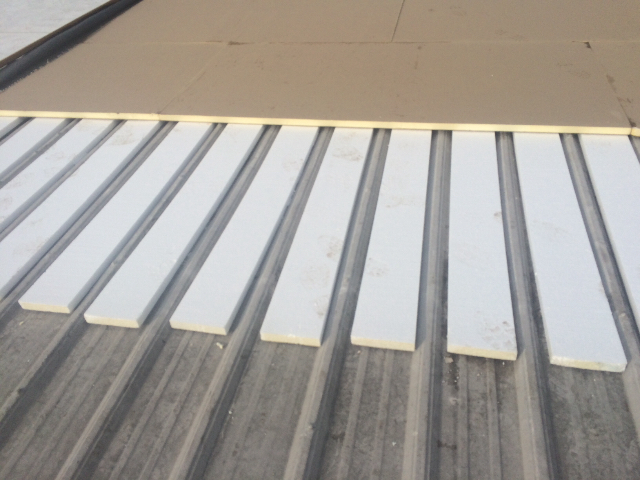 The new roof system consisted of a single layer of 1.5” flute-fill EPS board, loose laid into the existing flutes of the metal R-panel, creating a flat surface for the installation of the remaining roof components. Directly over the flute-fill, a single layer of 1.5” polyisocyanurate insulation board was installed. The two layers were mechanically attached to the existing R-panel at a rate of 6 plates and fasteners per 4’x8’ board. After the installation of the insulation and cover board, the roof was ready for the membrane. The membrane of choice for this project was a 60 mil Thermoplastic Polyolefin (TPO) by Johns Manville, a leader in the single-ply TPO market. The new TPO membrane was secured to the building’s purlins using the Rhinobond Induction Method as approved by the manufacturer for a 20-Year Total System Warranty. 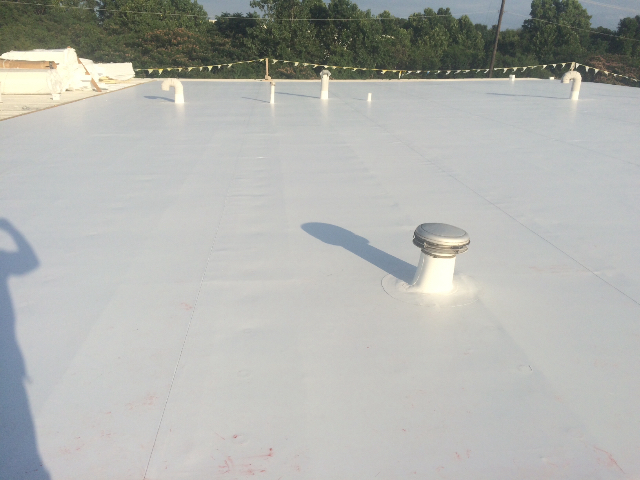 Once the membrane was in place, the PSR crew installed the TPO details around all rooftop penetrations and heat welded the membrane seams for a water-tight finish. Lastly, the PSR crew replaced the existing eave metal, gutters, and downspouts with new 24-gauge steel metal components, coated with a Kynar 500 paint finish. Along with installing the new roof system, the PSR crew was also tasked with the installation of new pressure-treated wood nailer around the perimeter of the buildings, cutting back the metal R-panel out of the gutter to increase drainage efficiency, and the installation of 24-gauge metal decking over the existing fiberglass skylights prior to the new roof system being installed. During this project PSR had to keep constant communication with various personnel, to make sure all parties involved were aware of where the crew was on the roof and when they would be over various tenant spaces. Each tenant seemed to have different needs. One of the most difficult tasks, on this project, was coordinating the re-roofing efforts over 7 huge printers that were vital to this tenant’s business. Even trace amounts of debris in these machines would have resulted in catastrophic consequences, as it would have halted their business production. Without proper attention to detail, and constant communication from PSR personnel, tenants, and ownership, this process would not have been a success. The project took approximately 6 months to complete and was a great success for both the owner and Peach State Roofing. The owner received a 20-Year Total System Warranty from Johns Manville, a 5-Year Installer’s Warranty from Peach State Roofing, as well as a 20-Year Paint Finish Warranty from Pac Clad. Peach State Roofing was founded in 1991, and established it’s Nashville branch in 2001. It is run by local personnel who care about the community that they service. Over the years, the Nashville branch has serviced countless clients, both large and small, with their commercial roofing needs. This project is just one of many that this branch has successfully completed over the years. Visit us today to see how we can help service your commercial roofing needs.